BINET. - Charte Constitutionnelle du 9 Aout 1830. Charte Constitutionnelle du 9 Aout 1830. - BINET. Title : Charte Constitutionnelle du 9 Aout 1830.. Date : France, ca 1830. Size : 17.3 x 14.2 inches. / 44.0 x 36.0 cm. 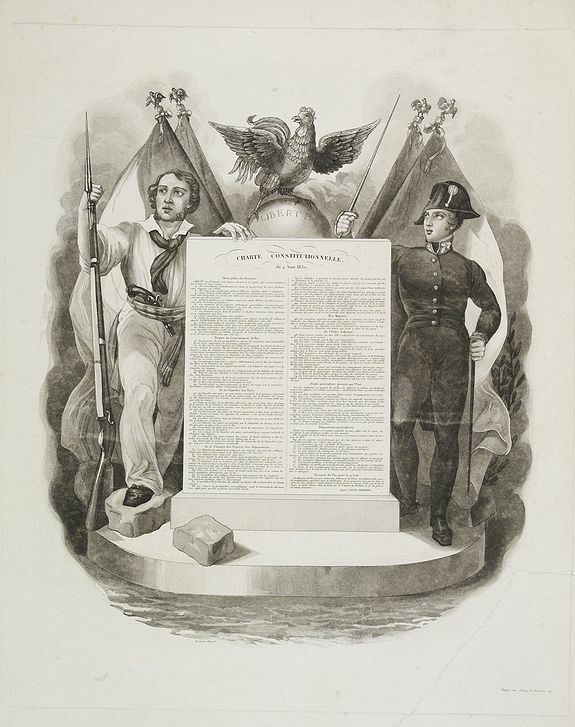 Description :Beautiful frontispiece of the Constitutional Charter of August 9th 1830 engraved by Binet. On August 7 the Charter of 1814 was revised, and its preamble evoking the ancien régime was eliminated. When voted on in the Chamber it was passed by 246 votes to 12. The new charter was imposed on to the king by the nation and not promulgated by the king. On August 9 1830, Louis-Philippe d'Orléans swore to uphold the Charter and was crowned "King of the French" (roi des Français), and not "King of France" (roi de France). The "July Monarchy" was to last until 24 February 1848 when the Second Republic was established. This Constitutional Charter of August 9th 1860 is an important document that removes from the king the power to instigate legislation; royal ordinances were henceforth to concern only the application of laws. Hereditary peerage was eliminated, but not the institution of peerage. The census suffrage system was modified and the poll tax was reduced to 200 francs permitting individuals 25 years old or older to vote, and to 500 francs for individuals 30 years old or older to be elected to the Chamber of Deputies. The law of the Double vote was abolished, and the number of electors was thus doubled, without nevertheless significantly increasing the size or characteristics of the electoral body: 1 out of 170 Frenchmen participate in the elections with the electorate at 170,000 which increased to 240,000 by 1846. Catholicism was no longer the state religion, but only the "religion professed by the majority of the French", censorship of the press was abolished, and the French tricolor flag was reinstated. Condition : Aquatint. repair of large tear in lower right corner. Ink surface a bit scuffed.